I've had my eye on this one for a while and the fact that it's a harem novel it's screaming my name. It sounds like a fun read and I'm looking forward to it. Getting bitten by a vampire in New Orleans is about as cliché as it gets, but Aurora Hedvige isn’t in a position to complain. In the last week, her life has gone from bad, to worse. Now she’s lunging for her best friend’s throat, desiring things she shouldn’t, and craving something she can’t admit out loud. Her last-ditch effort takes her to the self-proclaimed voodoo queen of the French Quarter, but what Aurora thinks is the end of her problems—is only the beginning. Carver Marceau has lived in a world of misery since the day his mortal years ceased and his immortal life began. He’s Kresova. 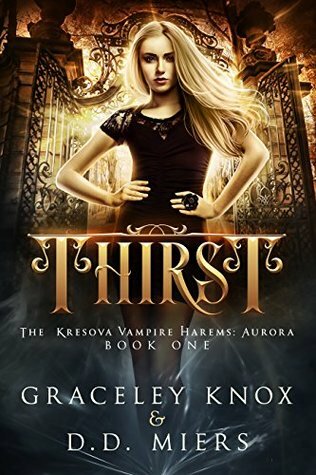 An ancient race of vampires ruled by a deadly queen bent on keeping her rein at all costs. Sent on a mission to resolve a recent string of rogue vampires, Carver’s journey leads him to Aurora. Neither of them expected the intense bond that forms between them, nor the revelations they uncover. Carver discovers that Aurora is one of the Dria. The first of three fated harem queens, destined to return the balance to the Kresova. With the help of friends, and enemies turned allies, they’ll upend the cruel queen’s reign—if they can just survive long enough. Nice! I really like the colors.